Our maps include your actual name, and a 3 or 4 letter code for your tables. For example, "John Smith" might appear on the floor plan as "Smith, John." The tables assigned to John Smith will be identified by a 3 or 4 letter code appearing within the outline of the tables. Tables for John Smith might be designated JSM, plus a number. If John Smith had 3 tables, they would appear as JSM1, JSM2, JSM3, etc. 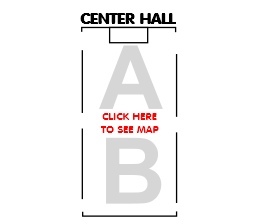 You can SEARCH the floor plans below to find your location and tables. 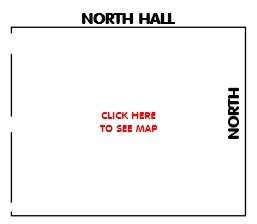 For the Cow Palace, click the Hall where you are located. For the Exhibition Hall, click the link below Cow Palace Halls. 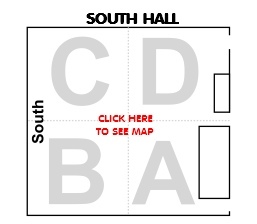 The floor plan map which appears tells you how to "find" your location and tables. Current show floor plans will be updated as vendors sign up, and your tables may be moved but should still be close to your preferred placment. Please check often and bring any discrepancies to our attention. general appearance of the shows halls. PLEASE NOTE: IF PAGE FAILS TO LOAD, PRESS THE F5 (function key 5) on your keyboard.